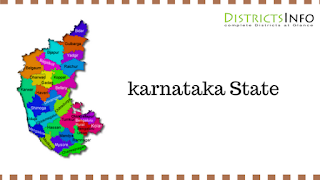 karnataka State with Districts in India: Karnataka a southwest state of India with Bengaluru as it's capital was formed in the year 1956 (as mysore state) later became as karnataka in the year 1973. The history of karnataka traces back to the periods of Mahabharata and Ramayana. The name Karnataka is derived from the word Karanadu which means Lofty land ( High plateau), derived from the community's location on the Deccan Plain. The name, also means "Land of black soil" (Kari - Black; Nadu - Area or Region) in Kannada. Kannada is the official language of this state of though people speak hindi Tamil and other languages too. Karnataka is situated on the western edge of the Deccan plateau and has its neighbours Maharashtra and Goa on the North , Andhra Pradesh on East , Tamil Nadu and Kerala on the South. On the west it opens out on the Arabian sea. Karnataka has 30 districts with Bengaluru being the biggest district.. Karnataka is the eighth largest state in India in area and Ninth largest state in India in terms of population. With 4 administrative divisions it has been ranked as 8th most populated state in 2011 census. The four administrative divisions are Bengaluru, kalaburagi, belagavi and Mysuru division. Vidhan soudha is the legislative assembly of Karnataka located in Bengaluru. Karnataka's geographic area is divided into three regions - coastal region of karavali, malenadu region comprising of Western ghats and bayaluseeme region comprising plains of deccan plateau. River cauvery originates from coorg district of karnataka and is often referred as Dakshina Ganga and Tala cauvery the birth place of river Cauvery is a sacred place and is considered as special tourist attraction. Rivers sharavati, mandavi, Malaprabha, etc flow through karnataka. Karnataka is considered as one of the best tourist and pilgrimage attractions with Udipi Krishna temple, Kukke subramanya temple, Sringeri, Nandi Hills, coorg, Mysore, tippu sultan palace, etc., and Bengaluru has many tourist spots like beautiful big gardens, temples, pubs, malls etc. Agriculture is the main occupation of Karnataka, a total of 123,100 km² of land is cultivated constituting 25.3% of the total geographical area of the state. Other areas of occupation are mining, transport, fishing, public administration, manufacturing, education, information technology etc. The state tree of karnataka is sandal, flower is lotus and the animal is elephant 🐘. Bandipur national park, and Nagarhole national park and Mudumalai national park are located in karnataka which are special tourist attractions. Note : If any Correction of Data Kindly Send Email to Us :( Districtsinfo.com@gmail.com ) We will update on our Website.